The Wallabies' most capped prop ever eclipsed the 51-Test record of his former Waratahs coach Ewen McKenzie against Ireland in the opening international of the 2008 season. Baxter went on to play in every domestic Test for the Wallabies in 2008 - one of just seven players to do so - and missed just the Test against Italy on the end of year tour. He made his Australian debut in a Bledisloe Cup Test against New Zealand just prior to the 2003 Rugby World Cup and was also part of the Wallabies' 2007 Rugby World Cup squad and scored his first international try in the match against Canada. A qualified architect, Baxter began his rugby career with Norths in 1998 and made his Super 12 debut with the Waratahs just two years later. He went on to earn nine caps in his maiden season behind Wallaby props Cameron Blades and Rod Moore. In 2003 became a regular starter for the Waratahs and toured Japan with Australia A before making his Test debut against New Zealand in the final Tri-Nations match of the season. He would later replace the injured Ben Darwin during the 2003 Rugby World Cup, starting in the opening match against Argentina as well as the final against England. In 2005 he featured in the Waratahs side that was beaten in the Super 12 Final against the Crusaders before finishing the Test year on the Wallabies reserves bench. The following year played in all but two of the 13 Wallaby Test matches, starting at loose-head prop on three occasions during the end of year tour. His second Rugby World Cup appearance came in France in 2007 where he racked up his 50th international against Canada and celebrated the occasion with his first Test try. But the Wallabies' hopes would again be ended by England - this time in the quarter-finals with the wallabies' pack left found wanting. 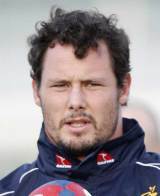 Baxter responded to personal criticism with a stand out year in 2008 that included another final appearance with the Waratahs where they were once again beaten by the Crusaders. However he did enough to impress new Wallabies' coach Robbie Deans who made him a key part of his new-look side. On the end of year tour there was also redemption for Baxter and his front-row colleagues with a powerful performance in the victory over England at Twickenham. In 2009 he surpassed Matt Dunning to become the first NSW prop to achieve 100 state caps and started the Test campaign as Australia's first choice tight-head prop but later lost that ranking to Ben Alexander, being omitted from the squad midway through the Tri-Nations. In 2010, he notched his 100th Super Rugby appearance against the Cheetahs and marked that occasion with his first try for the Waratahs. In 2011 Baxter announced his retirement from all rugby to pursue his career in architecture.